This interesting surname, with over two hundred spelling forms and recorded in every European country is of Ancient Greek origins. Popular before the Christian era, it derives from "gregorien", a word meaning to be awake or watchful. The name was borne by two fathers of the Orthodox Church. The first being St. Gregory of Nazianzene (circa 325-390) and the second St. Gregory of Nyssa (circa 331-395). However its initial burst of popularity owed most to St. Gregory, The Great, the first Pope of all., 590 - 604 a.d. The famous Crusades of the 11th and 12th century gave it another boost. It was the fashion and practice, for returning warriors from the Holy Land to christen their children with biblical or saintly names, particularly those associated with the early church. 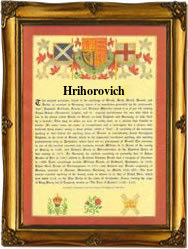 This was one of the most popular and the popularity is reflected in the wide range of the surnames. These stretch from Gregory, Grigor, Gligori, and Regorz, to Gruger, Greschke, Grzegorzecki, and Hrinchenko! The earliest of all recordings however are to be found in England, the first country to adopt both hereditary surnames and registers. Examples include John Grigory, in the Assize Rolls of the county of Somerset for the year 1280, and Joachim Gregorii, an attorney, of Magdeburg, Germany, in 1557. The first recorded spelling of the family name anywhere in the world, is believed to be that of Willelmus Gregorii, in the charters known as "The Danelaw" for the county of Lincoln, England, in the year 1143. Throughout the centuries, surnames in every country have continued to "develop" often leading to astonishing variants of the original spelling.